The year 1968 was tumultuous with workers’ accumulated frustrations igniting rebellion against capitalism and non-capitalist Stalinist regimes alike. Brewing discontent in France spilled over into outright social revolution. Meanwhile in the US, growing outrage at both the futility of the unwinnable war in Vietnam and heightened repression against the rapidly developing civil rights movement created a tinder box atmosphere which haunted successive administrations. The Stalinist states in eastern Europe were infected by the mood of revolt. In particular Czechoslovakia – today the two countries of the Czech Republic and Slovakia – which lay firmly in the orbit of the Soviet Union, as a result of the post-1945 carve-up of Europe into capitalist western and non-capitalist eastern spheres. Though resting on a nationalised economy, the Czechoslovak regime was not modelled on the principles of workers’ control and management established in the days after the 1917 Russian revolution led by Vladimir Lenin and Leon Trotsky. Instead it was a clone of the totalitarian state created by Stalin, representing a bureaucratic caste, resting and gorging upon the planned economy – while fearful of the working class and traditions of 1917 in whose name the bureaucracy nominally ruled. By the mid-1960s the Czechoslovak economy was barely growing under the monolithic bureaucratism that penetrated every layer of official society. There had been an attempt by the Communist Party of Czechoslovakia (KSC) leadership to experiment with a less centralised form of rule in 1965. But tentative steps in that direction had whetted the appetites of the intelligentsia and working class alike for a loosening of the dead hand of political repression, so the regime hastily retreated. These regimes were incapable of reforming themselves. The ruling elites were unwilling to relinquish their power and privileges, no matter how often they sought to resolve the riddle of why economic growth was slowing. Commandism from above could not develop the productivity of labour in a relatively developed economy like Czechoslovakia when the task was not conscripting vast armies of industrial workers into building giant factories and dams. The economy needed to move towards refinement of productive methods, increasing consumer goods and involving the working class at every level of producing, planning and distributing commodities. By 1968 the lack of integration between the industrial and agricultural sectors was huge. Meanwhile consumer goods, as elsewhere in eastern Europe and the Soviet Union, were in chronically short supply. It was this growing impasse, with the attendant dangers of a rising restiveness among Czechoslovak workers and youth, that led a section of the bureaucracy around KSC central committee member Alexander Dubcek to orchestrate the removal of his colleague, the hardline Stalinist president Antonín Novotný, on 5 January 1968. Dubcek’s main consideration was to avert political revolution from below through partial decentralisation and introducing elements of a tightly controlled market economy in certain light industrial spheres. This was followed by an ‘Action Programme’: easing press restrictions, permitting freedom of speech and movement – and hinting at the possibility of an end to one-party, totalitarian rule. Reform was to be unveiled – under the KSC’s direction. But these announcements led to the opening of the floodgates. The ‘Prague Spring’, as these few months became known, saw an explosion of ferment. Intellectuals rushed to produce independent publications, which caused disquiet and then outrage in satellite Stalinist states grouped in the ‘Warsaw Pact’ countries and taking their orders from Russian party leader Leonid Brezhnev. Despite hopes that this was a break with Stalinist methods that might offer an alternative to both Stalinism and capitalism, Dubcek’s “socialism with a human face” was not about creating genuine workers’ democracy. There were to be no free and democratic elections with the right of recall, no removal of the dizzying wage differential between party officials and ordinary workers, and no replacement of bureaucratic rule by democratic workers’ control and management based on workers’ councils. All these safeguards against creeping bureaucracy had been included in the 1919 programme of the Bolshevik party as necessities in even the first stage of a workers’ government. But to Dubcek and those around him, such measures would threaten extinction. 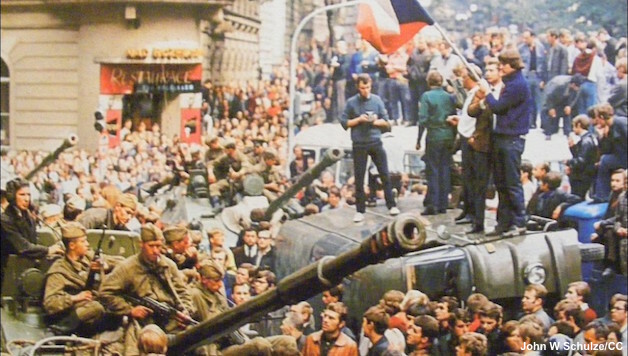 The Prague Spring was shattered when on 20-21 August Eastern Bloc armies from Russia, Bulgaria, Poland and Hungary invaded Czechoslovakia with the intent of reimposing hardline Stalinist rule. Czechoslovak forces were confined to barracks, while Dubcek urged no resistance. Justification for the military incursion was provided by the ‘Brezhnev Doctrine’, which stated the Soviet Union had to intervene whenever an Eastern Bloc country was in danger of moving back towards capitalism. This fraudulent claim had been used, too, against the incipient political revolution of the heroic Hungarian workers. Twelve years before they had twice faced a Moscow-ordered invasion as they struggled to overthrow the Stalinist regime. In Czechoslovakia, workers were not clear about the necessity of carrying through a political revolution and maintaining – but democratising – the state-owned, planned economy. Nevertheless, the reality was that Moscow and other Stalinist rulers feared Dubcek would lose control of the situation and an anti-bureaucratic revolution unfold. They had their own ‘domino theory’ – that an anti-totalitarian movement could spread to their own countries. The May events that had shaken France a few months before the invasion meant the idea of revolution was in Europe’s air. Once order was restored – and not without sympathetic reverberations among sections of the invading forces, which had had to be hastily removed for fear of fraternization – Dubcek was hauled to Moscow, stripped of his post, expelled from the KSC and sent in disgrace to live out his days as a forestry official. Western imperialism hypocritically condemned the invasion, drawing a veil over its long and bloody history of military incursions and conquests. In 1968 the Czechoslovak workers were unprepared and lacking a leadership to defeat the invasion. Nevertheless its echoes were to be heard again. The later Soviet leader Mikhail Gorbachev unveiled a last desperate attempt to reboot the sclerotic Russian economy in 1987, through the introduction of ‘Glasnost’ (openness) and ‘Perestroika’ (economic ‘restructuring’ and decentralisation). By 1987 the crisis of Stalinism was much deeper. And while protest movements did develop under Gorbachev, they did not crystallise into a movement with an anti-bureaucratic and anti-capitalist programme. This created a space for capitalists and would-be capitalists to seize the opportunity to begin the restoration of capitalism in those countries. The eventual implosion of these regimes in the late 1980s and early 1990s was greeted with triumph by world capitalism. Meanwhile many former bureaucrats effortlessly converted themselves into capitalists, ruthlessly pillaging the coffers of the deformed workers’ states. The restoration of capitalism, in its turn, has caused misery for the masses in the former Stalinist states. In two years after the fall of the Soviet Union, the crash in production far outstripped that which occurred in the United States during the Great Depression of 1929 to 1933. In 2014, 28% of Czechs said they were better off under ‘Communism’, while only 23% felt life is better now, according to the Czech polling agency SC&C. The task of implementing the socialist revolution there and everywhere remains the most pressing struggle of the world working class.